The Game is on for Sunbury’s Business Pitch Competition! 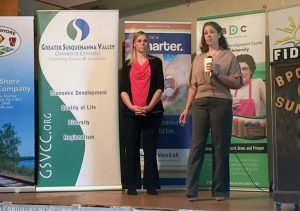 Sunbury’s Revitalization, Inc., in partnership with Bucknell’s Small Business Development Center, is excited to host its second annual Business Pitch Competition! The final three competitors have now been selected and will be presenting their business plans on November 12, 2016 at the Elks Lodge in Sunbury. This event will begin at 2:00 p.m. and is open to the public. The final two competitors, Crafted Cafe and Eclipse Craft Brewing Company, will pitch their business plans to a panel of judges in a “shark tank” fashion. The judges for the Biz Pitch are: Jeff Balestrini (Chief Lending Officer of Service 1st Federal Credit Union), Bob Garrett (President & CEO of the Greater Susquehanna Valley Chamber of Commerce), and Lynda Schlegel-Culver (Pennsylvania State Representative 108th Legislative District). The winner of this competition will receive a prize package valued at more than $10,000 (which will include a $6,000 rent credit, as well as several professional services, including: legal, accounting, IT, and branding and marketing). For more information, please go to www.SRIPA.com or email Aimee Buehner at aimee@bowenagency.com or Loni Briner at lamartz@nshr.com. The 2015 Biz Pitch winner, Radiance Holistic Center and Academy, launched their business in April 2016 in Downtown Sunbury. More about this successful company can be found on its website at: www.radianceholisticcenter.com. Radiance Holistic pitches at the 2015 competion. This event is sponsored by Service 1st Federal Credit Union, the Sunbury Motor Company, the Sunbury Broadcasting Corporation, the Greater Susquehanna Valley Chamber of Commerce, the Elks Lodge #267, and the North Shore Railroad Company. Comments Off on The Game is on for Sunbury’s Business Pitch Competition!